This Google+ case study of 34SP.com will show how powerful the network can be when maintained properly. +34SP was a new Google+ page when they started working with us in 2015. Within a few months, we were able to significantly increase the amount of traffic generated by Google+ to 34SP.com using our highly refined system which focuses on quality content createion and audience engagement. In November of 2015, we started building collections for 34SP.com based on their expertise in WordPress. This proved to be a great move. One of their Collections, WordPress Tips & Tutorials, is “hot” and is gaining thousands of organic followers per month. This targeted collection gets terrific engagement and is currently #1 on Google+ in many WordPress related searches and aligns with their goal of being known as a WordPress Hosting Company “Serious WordPress Hosting for serious WordPress users”. 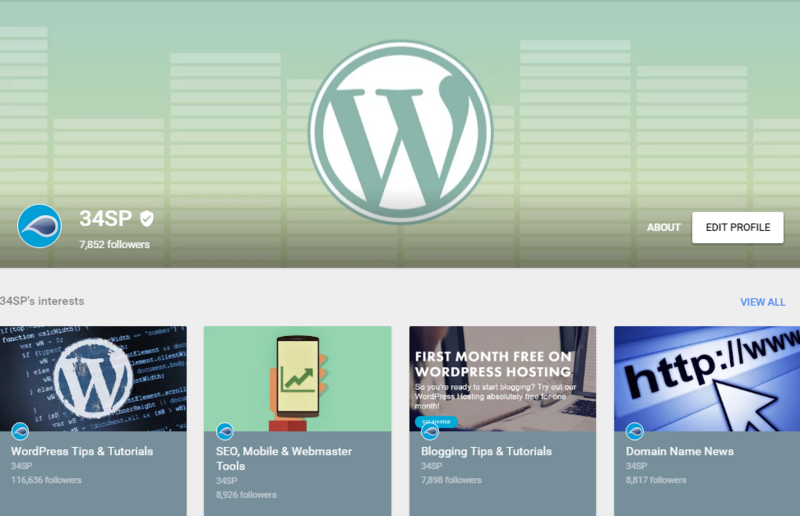 The collection, “WordPress Tips & Tutorials“, currently gains 300 new followers per day, equaling over 9000 new followers a month. Below you can see a detailed timeline of just how much growth this one Collection experienced in the timeframe we’ve been working on it. Can you get traffic from Google+? It is undeniable that, despite what some might think, Google+ can drive significant amounts of traffic. This one client went from having no traffic from Google+ to an average of 500 users per month and now to a sustained growth of over 1,000 users per month. Not bad for a small WordPress web hosting company out of the UK. Are you driving an average of 1,200 clicks per month to your web property from Google+ alone? Clicks are great, what about engagement on Google+? Social networks thrive on the social interactions within the network to propel and deepen the community. Followers need to be engaged with the brand, as well as other followers in order for sustained growth to occur. Would you like to see one example of how we were able to drive engagement for 34SP? In less than 24 hours of posting a poll, 34SP received 765 votes! That is 100% organic social reach– no “boosting” or advertising needed. Are you ready to begin growing your Google+ page to drive these kinds of results? Get in touch with our team today.